The Nashville Predators went from being a dark horse, to Stanley Cup contender with the announcement the star forward Alexander Radulov is about to return to the NHL. Radulov who was drafted out of the Quebec Major Junior Hockey League in 2004 with the 15th overall pick only played two seasons with the Predators. In that time he produced 44 goals, 51 assists for 95 points in 145 games. That is .66 points per game. In 2008 Radulov, while still under contract left the NHL to play in his native Russia in the KHL. The defection was highly controversial as he was under contract with Nashville. Now he is returning and there are still several players that were with the Preds during his defection such as Shea Weber, Ryan Suter, Jordin Tootoo, and David Legwand who may have some hard feelings for Radulov after he quit on the team. The fact remains that Radulov is a highly skilled goal scoring player, who brings to the team what they desperately need. Goal scoring! This is a business and the players are professional who want to win. There will be no hard feelings, only open arms to welcome back a significant piece of the puzzle. In four seasons in the KHL, Radulov has 91 goals, 163 assists for 254 points in 210 games. Radulov remains under contract with both the Nashville Predators in the NHL, and with Salavat Yulaev in the KHL. Radulov will play on Thursday as the Preds are in Pittsburgh and he will play out the remaining 10 games of the regular season and in the playoffs. This will fulfill his current contract with Nashville and make him an unrestricted free agent on July first. 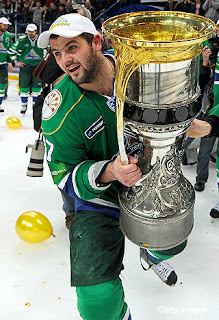 For the 2012-2013 season Radulov has a contract in the KHL and will receive a qualifying offer from Nashville to stay in the NHL. He can choose either. If there is a work stoppage in the NHL due to CBA bargaining he can fall back to Russia. Assuming the NHL resolves the CBA negotiations and the NHL season is uninterrupted, Radulov is free to remain in the NHL. The return of Radulov will undoubtedly have a major impact not only on the Preds playoff run, but it will have an ongoing impact as well. Not only will he provide his offensive ability, but having Radulov will make the decision for UFA Ryan Suter to remain a Predator perhaps easier to make. GM David Poile has said he and team ownership are working to retain both Suter and team Captain Shea Weber who will be RFA July first. The team is prepared to spend up to the cap and has already committed significant cap to star goalie Pekka Rinne. Last year Nashville won their first playoff series and lost in six to the Vancouver Canucks in round two. A year later, the Predators are more experienced and added Andrea Kostitsyn, Paul Gaustad, and Hal Gill at the deadline. The emergence of Craig Smith and Ryan Ellis add to the team’s depth. Radulov may line up on the top line with David Legwand and Andrei Kostitsyn, leaving the line of Sergei Kostitsyn, Mike Fisher, and Martin Erat who are playing well in tact. Suddenly the Preds have a deep roster and are poised to make a deep playoff run. The return of Radulov may be the biggest deadline addition (or in this case post deadline) providing a serious Cup run, and may pay dividends in keeping this promising core of talent together. Posted by pharling at 4:17 p.m.